Tornado being towed to Peterborough after failing on the Ebor Flyer. Photo by Nigel Gibbs on Flickr, used by permission. Sadly the first item in this round-up has to be the high profile failure of Tornado on its inaugural 90mph run in passenger service, the Ebor Flyer, on April 14th. The A1 Trust has given regular updates on the situation, as information has emerged. Tornado failed just south of Sandy, after an apparently successful burst of 90mph running, with a broken combination lever. This failed due to the front valve on the middle valve spindle having seized in the liner. With the lower part of the combination lever broken off, it and the drop link separated from the cross head. The Trust’s diagnosis is that the failure was ‘almost certainly’ caused by a lubrication failure, and would have occurred even at 75mph, albeit probably slightly later. Tornado is currently at the Nene Valley Railway for repair, having been towed there immediately after breaking down. A new combination lever and union link have already been forged by Setphenson Engineering at Atherton, and are ready for machining. An offer of the use of the same components from 60532 Blue Peter may therefore not prove necessary, although the A1 Trust have visited Crewe to inspect them and confirm their suitability. The Trust has expressed its gratitude for the many good wishes and offers of support from across the rail industry and enthusiast community. 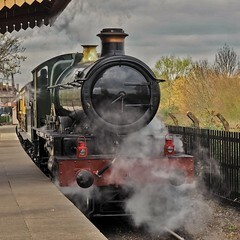 The setback follows a start to the year with many positives: the Trust has won two Heritage Railway Association awards; a street in Darlington has been named after Tornado; a fix was found to a highly vexing AWS fault; and while at the North Yorkshire Moors Railway Tornado reached the milestone of 100,000 miles in service. New Build Steam’s interview with Mark Allatt of the A1SLT, conducted before April 14th, attracted much positive feedback, and can still be read here. Thanks are also due to Simon A W Beeston, who has added many excellent photos of Tornado to the New Build Steam Flickr pool – further photos of any and all new build steam locos are of course welcome there. The strongest candidate for the next new build to steam is having finishing touches added, ahead of its initial roll-out in BR black. The major announcement trailed in previous updates on 82045 turned out to be that the chassis would be put on its coupled wheelsets, with a move into the workshop in prospect at some point thereafter (and therefore somewhat earlier than expected). The locomotive was indeed wheeled on April 17th, opening the way to the fitting of many other major components. Meanwhile, a quote from the SVR for completing the boiler and firebox has been accepted, and the work will be completed in the next available slot – the SVR has made clear it is keen to see 82045 in service as soon as possible, to which end more work than expected will be contracted out. This gives a build time of 15-18 months for the boiler once work starts, and an ambition to see the locomotive in steam six months after that. This will, however, require the raising of £200,000 over and above existing plans in the next three years. The project to build a Churchward ‘County’ 4-4-0, covered in the previous round-up, now joins the roster of projects to be covered regularly on this site. The 38xx class were in some senses a shortened ‘Saint’, albeit using the smaller GWR No.4 boiler, and were in service from 1904 to 1933 (therefore without any overlap with the post-war ‘County’ 4-6-0s). The project has arisen in order to fulfil the agreement made to cover the use of ex-Barry locomotives 2861, 5227, 7927 Willington Hall and Large Prairie 4115 as donors for numerous of the GWR projects covered here; to achieve this, the Great Western Society is supporting the construction under the auspices of an independent group. The Churchward County Trust, created for this purpose, will fulfil some additional goals, over and above building and operating the locomotive: from a GWR engineering perspective, perhaps the most interesting is the creation of an online spares and patterns database for GWR components, maximising the usefulness of the company’s standardisation policy even into the 21st century. Design work will be undertaken by Elliot Powick, already a veteran of the Night Owl project and firebox work for 82045, CME on the F5 and designer of new cylinders for 28xx and ‘Hall’ locomotives. Components already available for use include a boiler (ex-5227), axleboxes, hornguides and an appropriate tender frame. Work on 1014 has continued steadily, despite the downbeat tone of recent updates. Riveting on the tender and drawings for the smokebox and saddle / door unit are among the notable areas of progress. Hearteningly, the Grange project’s website is now talking in terms of ‘when’ 6880 steams within the next 12 months. Updates cover the overhaul of 3814’s tender, under loan for use behind Betton Grange, and work on the boiler at Tyseley. The Night Owl’s wheels are now prepared, raising the prospect of another new build rolling chassis existing soon. A target date of 2022 for completion has now been firmly set. 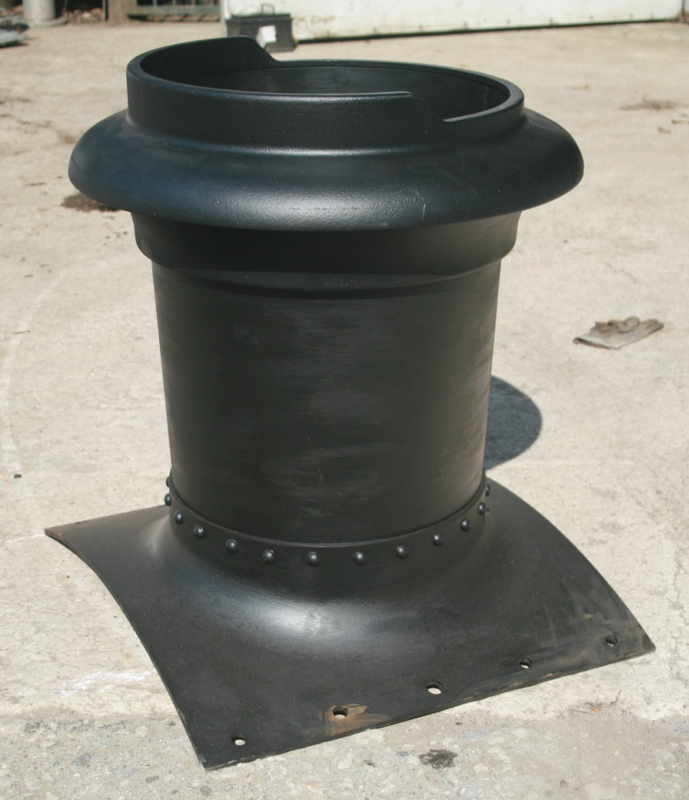 The new chimney for 2013, photo used by permission. The George the Fifth project boasts a new website and, more materially, a newly manufactured chimney. Other castings are in progress, while the design work on the motion remains a major focus. The details of work on compliance and approvals are also of particular interest. Fundraising for the P2 has now raised more than £2million of the £5million needed, rising to nearly £3million if pledged funds are also included. A dedicated Motion Club has been launched to fund the motion, which has to be ordered this year in order to ensure the locomotive is completed in 2021 as planned. The wheels, axles and axleboxes are all now in Darlington, although wheeling has unfortunately been delayed by an error in machining the keyways on the three plain coupled wheel axles; fortunately the overall completion date is not affected, and the supplier in question replaced the parts at their own cost. The running plates with their ‘Gresley curves’ has been the major focus of work on the Footballer – note that the Facebook updates below contain more photographs of progress than the regular newsletter format permits. The AGM occasioned an informative report on the progress of the static chassis in particular, while work to specify and cost the design and manufacture of the boiler has also been kicked off. The efforts necessary to turn the F5 into a rolling chassis, following the now imminent assembly of the frames, are well into the planning. Specific sponsorship is being sought of numerous key components, which will ultimately furnish the locomotive with its wheelsets and crank axle. On the design side, missing drawings and even mis-matches between extant drawings of different eras have presented challenges for CME Elliot Powick. Progress on 567 continues across both design and manufacturing fronts, with steps made on the motion parts and frames, and the design of the valve motion. The Brighton Atlantic group has been powering through the hard slog of boiler work, and is now approaching a hydraulic test at some point this year, for which the boiler will have to be moved out of Atlantic House. As ever the latest update is accompanied by plenty of photographs. The 35011 group, newly accepted as members of the Heritage Railway Association, suffered from a cancelled working group as a result of the bad weather in March. More positively, components previously bought have now been collected, and a new set of items are available for sponsorship. Doorplate being marked out at the West Shed – photo by Kevin West. 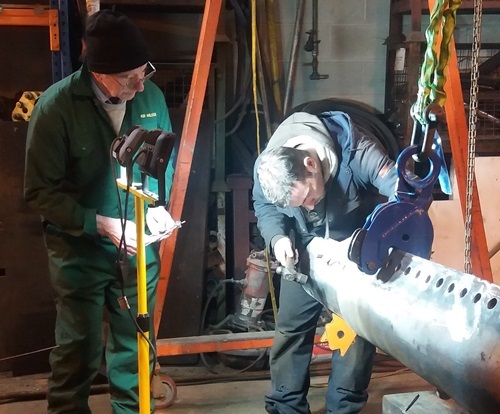 Work on the boiler is now well underway at Heritage Boiler Steam Services, pushing towards readiness for drilling the necessary rivet and stay holes. The doorplate was briefly returned to LNWR Heritage at Crewe for rectification of a small issue; the entire process, including transportation, was completed within a week. On the chassis side of things, alignment, preparation and fitting of the motion and valves continue variously, as does design work on the lubrication system. The main reported areas of progress on the Clan are the main cylinder pattern and the bogie wheel centres. An OO gauge model of the G5 was launched by Bachmann on February 26th, presented in several variants including 1759. Numerous groups have marked the passing of Sir William McAlpine in March. He was Patron of the Clan project, Trust President of the Doncaster P2 group, and a long-standing supporter of the A1 Trust, including being a covenantor on Tornado. Looking beyond these shores, a news report showing V499’s completed cab is available below (readers who are aggravated by confusion of the terms ‘train’ and ‘locomotive’ should brace themselves), while the PRR T1 group have set out their plans for the boiler, including raising purchase orders for the first two parts of it. I absolutely love this new format! It provides both a general summary for those who want a basic understanding of a particular project and links for those seeking more specific information. I like this style. A nice summary of progress followed by links to further detail seems like the way forward.